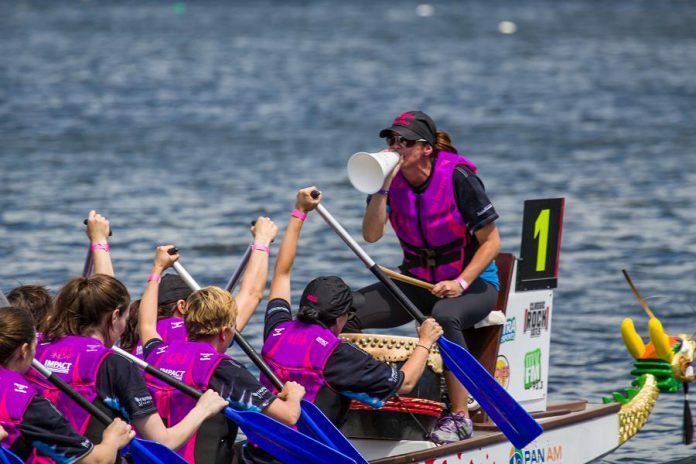 It’s no coincidence that registration for the 18th annual Peterborough’s Dragon Boat Festival opened today (March 8) — International Women’s Day. 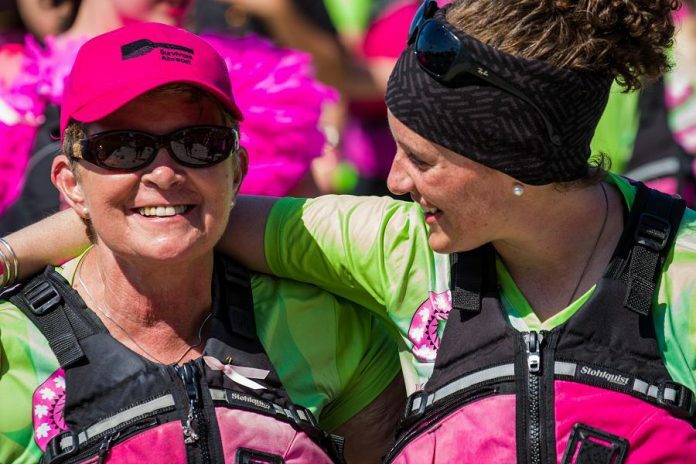 Experts predict that one in eight women will develop breast cancer in their lifetimes, and the festival has raised $3.1 million over the past 17 years to help improve breast cancer treatment. Organizers encourage everyone to ‘Get in the Boat’ (#getintheboat on social media) and register now for the 2018 festival, which takes place on Saturday, June 9th at Del Crary Park, at www.ptbodragonboat.ca. This year’s event has some new features for participants and visitors. While the luxury ‘Dragon’s Lair’ for the top fundraising team returns, there will also the slightly less luxurious ‘Dragon’s Loft’ and ‘Dragon’s Nest’ for the second and third place fundraising teams. The minimum age to register has been lowered to 13, so that even more young people and families can take part. There’s also a new ‘Paddler’s Pool’, where people can register online as individuals if they’d like to participate in the festival but don’t have a team. For anyone who wants to learn about the event in advance, festival organizers are also hosting an “open house” for Thursday, March 22nd from 7 to 9 p.m. at the Trent University Athletics Centre. Visitors can even join Survivors Abreast team members in the tank and give paddling a try. Funds raised through this year’s Peterborough’s Dragon Boat Festival will help the Peterborough Regional Health Centre (PRHC) Foundation invest in new laboratory automation technology to ensure PRHC’s lab technologists can provide pathologists with the materials they need to make accurate breast cancer diagnoses even sooner. Lesley Heighway, PRHC Foundation President and CEO, explains that without the lab, there would be no cancer care at PRHC. For the 17th year, Kawartha Credit Union is also returning in 2018 as the festival’s Platinum sponsor, continuing their commitment to the community and the cause. Two new registration rates at www.ptbodragonboat.ca allow team captains to take advantage of savings and help raise awareness about the festival: “The First 18” (18 spots only, available until March 18th or until the spots are gone) followed by the “18th Anniversary Rate” (18 spots only, available until March 28th or until spots are gone). Regular registration continues into the month of May. National and international news headlines.